A few things you should know about me: (a) I don't camp, (b) I don't camp, (c) I don't camp. 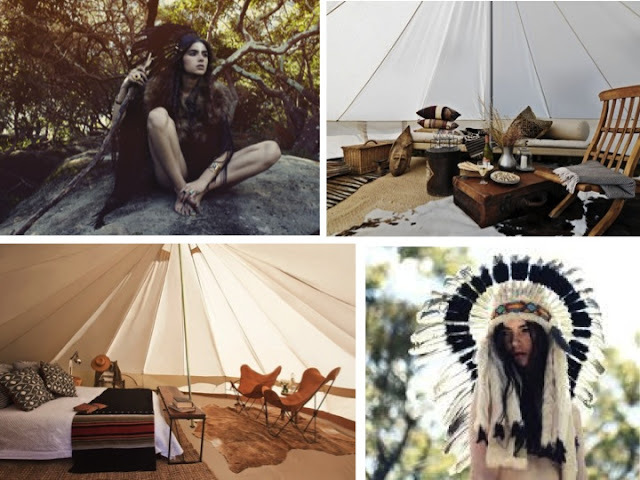 But the dreamy indoor teepees above got me thinking that there just may be hope yet for the inner wilderness girl in me...That is of course if I have running water and a wireless connection;) Hope you enjoy the high style teepees below and the fashionable muses I envision would inhabit them. I'd like to spend some time in such a luxurious teepee. If I would have a big balcony I would love a teepee, to sleep under the stars :). I made a blog a couple of months ago. I would really appreciate it if you could check it out and follow if you like it!!! I ♥ your comment ! These rooms look great! So well decorated! I really like the concept. It's sort of like Native Indian architecture meets Scandinavian design. I'm not much of a camper myself (too many spiders) but I love these tepees. Love your blog, dear ! I'd love for one myself... They are the epitome of indoor cool! Love all these fabulous pics hun! Love the tribal/native look lately. These photos are so inspirational. I never used to like camping either but my husband persuaded me last year to go anyway! I must say, it was really fun! Thanks for leaving such a lovely comment! Love these pics! The tribe in my town will be having their annual pow wow soon :P now I have some fashion inspiration if I go! 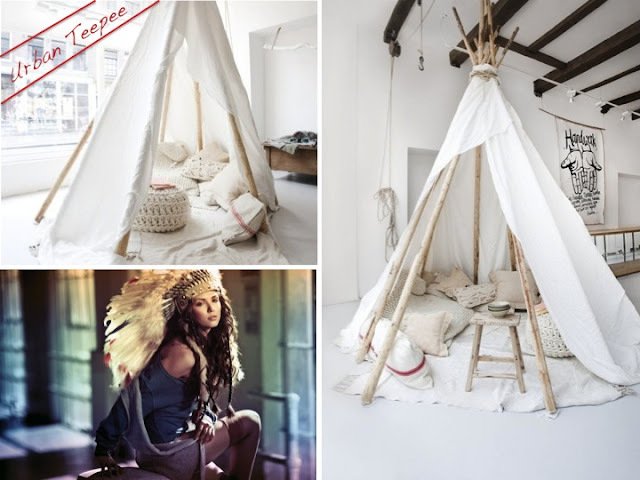 I totally want to have a teepee in my apartment! I would love to live in that first teepee! How gorgeous is that! There is the hotel near the 4 corners where you can stay and all of the rooms are these high-tech teepees with showers, air conditioning, the whole 9! it's pretty neat. really love those indoor teepees as well. Your blog is the perfect place to get inspired, Im so in love ! Much love from Morocco ! That is so cool! Really adore it. 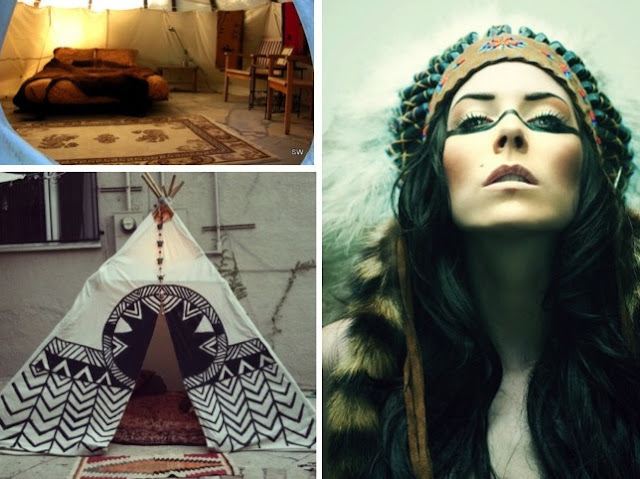 Those indoor teepee's are gorgeous. They would provide the perfect spot to relax! A girl can definitely dream! I love tipi's. 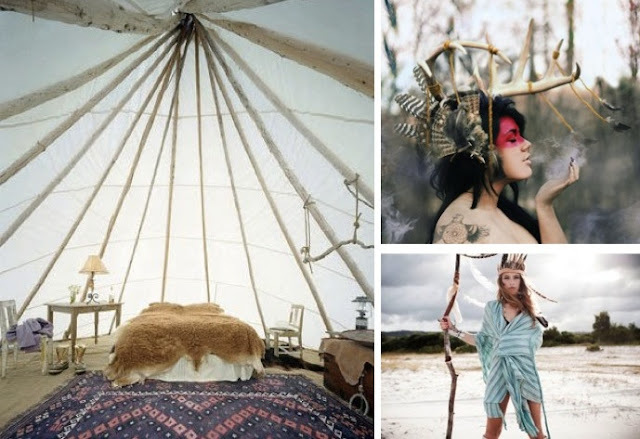 I would love to organise a tipi style wedding.